I’m an optimist. That’s no secret. 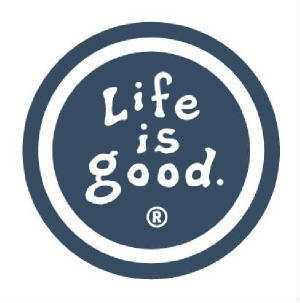 Because of this, I have more “Life is Good” t-shirts than I can count. I’ve also got the Life is Good book, which is where I saw the quote above. I read this quote recently as I was waiting to leave for the airport. It struck me at that moment just how alike a game of catch and a real conversation can be. In a game of catch, one person throws and the other catches (ideally). In a conversation, one person speaks and the other listens (again, ideally). In a game of catch, if the person throwing is inaccurate, it makes it difficult (if not impossible) for the other person to catch the ball. In a conversation, if the communicator is vague, condescending or rude, it makes it difficult for the listener to pay attention to the meaning of the message. In a game of catch, if the catcher is not paying attention, they could miss the ball or be injured if they don’t get out of the way. In a conversation, if the listener isn’t paying attention, they could misinterpret the message or overlook an important detail that could back to haunt them later. In both scenarios, things can go horribly wrong in a hurry. When it comes to communication, success comes down to a few simple actions. Pay attention – whether talking or listening, factors of success increase exponentially when you focus on what you are doing. Be aware of others – does your listener look confused or uninterested? Make sure you sending the right message by watching their reaction to what you say. Don’t assume they understand just because you moved on to the next topic. Don’t interrupt – cutting someone off mid-sentence not only changes WHAT they communicate in that moment, but also changes how they feel about communicating with you in the future. It’s been said, by more people than just me, that effective communication is the key ingredient to effective relationships. Have you seen the NEW www.performanceoptimist.com? What are you waiting for? If you attended the IAAPA Expo last week, you saw the results of a lot of hard work. Did you know that much of that work was done by volunteers? Here are some of my favorite volunteers – The IAAPA HR Committee! Go to an education session? The people that have been working since January to pick the right topics, speakers and mix of programming for you, along with the speakers themselves, are volunteers. Attend the Brass Ring Awards? The people who sift through the entries and determine the best of the best of our industry… volunteers. Interact with a Show Ambassador? Maybe they checked you into an education session, helped you find Dippin’ Dots or welcomed you onto the bus on the way to Universal. Yep, volunteers. Why all this talk about volunteers? Because in this day and age of tighter budgets and doing more with less, we have to find out what really motivates people, and I think we can get some really good insight by looking at why the volunteers do what they do. So why do people volunteer? They believe in the cause. Whether it’s helping clean up after Hurricane Sandy or planning education programs, something about the process connects to the individual on a deep level. They feel “compelled” to do what they can to help. They feel they can make a difference. They understand that their contribution of time, effort and care will help someone else grow, learn, or sometimes, survive. They know they will be supported. Causes are not taken on by individuals, but by teams. A united front gains momentum through helping others and continuing to move forward, even if it is only an inch at a time. Do you have a “cause”? This could be why you are in business, how you want to serve your guests or treat employees. The cause itself isn’t as important as getting your employees to believe in it. Can your employees make a difference? YES, and they can choose to make a positive difference in the lives of your guests or a negative one. Many people don’t know how they impact the company, so they don’t know what a difference they make. Are your employees supported? By you, perhaps. But what about the rest of the leadership team or the other employees? No employee is an island. Remember all the things mentioned above that are accomplished by volunteers? Now think of the things you struggle to get your employees to do… What’s missing? Here’s a hint… it’s not money. In case you haven’t seen it, I recently launched a brand new version of www.performanceoptimist.com. Come check it out! If you are in the attractions business, you DO NOT want to miss the IAAPA Attractions Expo, happening Nov. 12-16, 2012 in Orlando. It’s such a fun week, and a great chance to see old friends, make some new ones, and get all charged up about what’s happening in the industry. if you are going and haven’t figured out how to make the most of your time in Orlando, let me help. Here are links to some great resources so you don’t miss any of the good stuff! Registration – in case you are REALLY a procrastinator! I hope to see you all in Orlando in a few short days! If you can’t be there, I will of course be tweeting (@PrfrmnceOptmst) as much good stuff as I can, and may even post to the blog if I have a chance. If I can’t see you in person, feel free to follow along!